Want to be notified about Sienna Ranch program options, including Thanksgiving Camp? Sign up below to receive our newsletter in your inbox. This popular holiday camp includes the highlight lessons and activities from Sienna Ranch’s year-round homeschool and after school classes. Possible activities include shooting a bow and arrow, tracking wild animals in the hills of Briones, creating art with natural materials, caring for ranch animals, crafting in our woodshop, tending our organic garden, and learning survival skills, “Everything” Ranch camps give campers a taste of it all! Activities will vary based on age group. The “Everything” Ranch Nature Camp will be different in each session so feel free to sign up for all our holiday camps! *Want to make sure friends/buddies end up in the same group? Make sure to select the same class number (#1 or #2) and you’ll be all set! Riding, horse-themed games, vaulting and horsemanship skills are the main activities in this camp. Campers will enjoy daily mounted and dismounted lessons in riding and horsemanship and other fun and educational horsey activities. Each day they will work on new skills appropriate to their level during their mounted lesson. Groundwork games, activities, and crafts will include instruction in horse communication, grooming, tacking, leading & tying, and how we care for horses to keep them healthy and happy. When they are not working directly with the horses, campers will spend time practicing skills on the ground via various games and exercises that help develop their ability in the saddle. Our Equestrian campers love getting to know our 7 horses and one pony! Campers can attend an Afternoon Special Interest camp only, OR add it on to a Day Camp for a full-day Sienna Ranch experience. Ranch Play extended care from 1:00-2:00 is offered at no charge for full day campers, and can be added to a morning camp for $30. Ranch Play drop in’s are $15/day. Campers will enjoy learning or improving their archery skills, with an opportunity to shoot up to an hour and a half each day on Sienna Ranch’s 25 yard archery range. Instructors model and encourage proper shooting form and techniques and help campers to reach their potential. Over the course of the week, campers will make an arrow and target to take home. Beginners are welcome to register. Campers will be delighted by making useful and beautiful clay projects in Sienna Ranch’s engaging pottery camp. This hands-on exploration into pottery has a unique Ranch twist as campers learn to put their imagination into their creations. We will explore new hand building techniques each day and complete take-home projects which encourage investigation into size, shape and form. Fun With Horses campers do exactly that, spend a week having fun with horses! Children in this special interest camp will have the opportunity to learn to “speak horse”, as they are introduced to the various ways horses communicate with each other and with us. Using fun games and activities, campers will learn about colors and breeds of horses, parts of a pony, and gaits. They will participate in the various ways we care for horses to keep them healthy and happy, such as grooming, stall care, and feeding. Highlights of this week for many of our campers are the times spent with pony rides, leading, and grazing, and creating chalk or painted murals right on a horse! 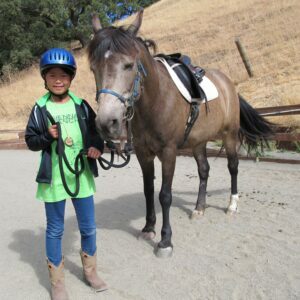 Note: For a camp with a focus on riding instruction, please see our Equestrian Camps or join us for weekly riding lessons. Full-Day Discount: Register for a full week of AM camp, Ranch Play and PM camp and receive the value of Ranch Play free. Early Pickup: Early pick up is discouraged as it may disrupt the flow of the camp and the experience of all the campers. Please only enroll in morning camp programming your camper can attend in full. For afternoon camps only, early pickup at 3:30pm is available upon reservation. Please fill out the form to arrange early afternoon pick up below with at least 24 hours notice, otherwise we cannot guarantee your camper will be available for early dismissal.